I visited Hemsö Fortress today. 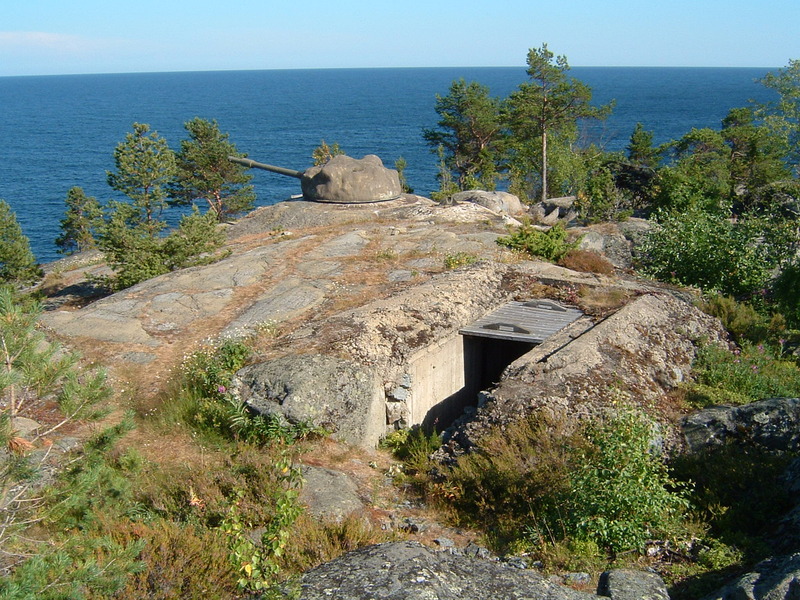 It’s a bunker in northern Sweden carved into the side of a mountain. It was built in preparation for the Cold War. Huge naval guns point out to the Baltic sea, ready to defend against an impending Soviet invasion: an invasion which never came. Seeing that enormous fortress, once a hub of important military activity, turned into a tourist attraction got me thinking: how often in our life do we construct mental forts, endlessly running drills, building resources and preparing for the worst – completely unnecessarily? Let me give you an example. You arrange to meet a few friends for a cup of coffee, and forget to invite a member of the group, realising only afterwards. This tiny, insignificant oversight starts to grow and grow in importance in your mind: if they find out, what will they think of you? What will they say? Could it ruin the friendship? Maybe they’ll think it was because of that thing they said to you at a party six months ago. What if they never forgive you? That’s an extreme case. But it happens. We worry about things that have never happened, most probably will never happen – and time spent worrying is time wasted. Jumping to the conclusion that firstly, the negative outcome will happen, and secondly that it will be worse than you can possibly imagine. It’s incredibly damaging to our psyche to expose ourselved to fear, doubt and anxiety so needlessly. The only way for us to stop catastrophising, and get on with our lives is to accept that there are certain things in our control (how we respond to outside events, the way we conduct ourselves, how we spend our time and energy) and things we can’t (freak accidents, the stock market crashing, what the weather will be like today). This acceptance is a key principle of Stoic philosophy known as ‘amor fati’ – loving fate, whatever happens. Define your problem. Be specific. Vague, undefined fears and feelings are your enemy here. Half the time, writing down your concern in explicit detail will reveal just how inconsequential the problem is. If not, at least you’re much closer to solving it. You eat the elephant one tiny bite at a time. Explore all your options. Don’t skimp on this stage. Sheer volume is a positive here. Write down as many potential outcomes as you can think of – start with the absolute worst. Confront your fear head on. Once you see how many ways things can go, you’ll stop focussing on the negative as much, and understand it’s only one out of many possible outcomes. Plan the fightback. How, exactly, could you remedy each of your outcomes? What could be done, were the worst to happen? You always have options. My post about the relentless banana king should show you that. So what are they? I’m a worrier. I always have been. But following some of these tactics has helped me remain calm in the face of some pretty huge problems. I hope it helps you too.